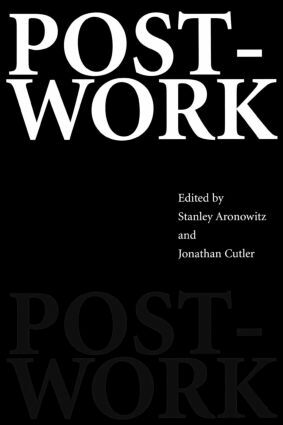 In Post-Work, Stanley Aronowitz and Jonathan Cutler have collected essays from a variety of scholars to discuss the dreary future of work. The introduction, The Post-Work Manifesto,, provides the framework for a radical reappraisal of work and suggests an alternative organization of labor. The provocative essays that follow focus on specific issues that are key to our reconceptualization of the notion and practice of work, with coverage of the fight for shorter hours, the relationship between school and work, and the role of welfare, among others. Armed with an interdisciplinary approach, Post-Work looks beyond the rancorous debates around welfare politics and lays out the real sources of anxiety in the modern workplace. The result is an offering of hope for the future--an alternative path for a cybernation, where the possibility of less work for a better standard of living is possible.